Really? This game could’ve been wayyy better. It’s literally just a money grabber. It’s super boring and meaningless. I literally playing this game with a straight face and no positive emotions. Then, you guys tried to get me for more micro transactions. And what the hell is up with the clothing changes? I choose a different set up armor and my clothes just stay the same. What a booboo game. This game is so bad, and I’m only on the 2nd campaign mission! First off, the iOS controls are the worse I’ve ever encountered. I can’t get the guy to go where I’m trying, he just keeps climbing and jumping off everything he gets close to. And don’t try to look around as he just starts climbing and jumping in that direction. Second, the description of the game leads you to believe this will be an open world rpg, but so far it is nothing but a guided campaign. Chase the thief for 1 block, then avoid the guards, like that’s possible. What a waste of money and time! After beating campaign it will stop working. Just simply don't buy it. Love it, but there aren’t very many missions, the only reason I’m giving it 4 out of 5. Plz take into consideration that some girls play this, too. Please add female assassins in the next update. Thank you! Great game but after playing the first few missions, the menu no longer fully loads. 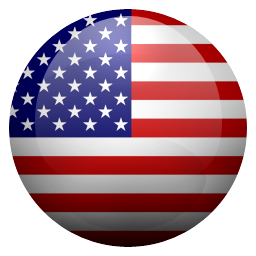 I mean it’s a cool app icon but not worth five bucks if it stops working after three missions. I downloaded it after a hassle with Apple for the bull crap charge of 1.99. Played twice and now it freezes on a blank title screen except words at top and bottom. Can’t select a dang thing! I want my refund!! After the tutorial, stalls after creating an account. 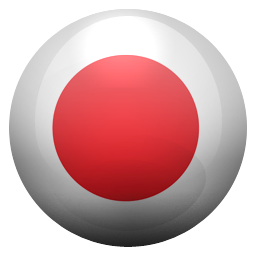 Paid games should work, app support takes you to an empty forum too. I remember this game a year ago. i had tons of fun, and submitted a four star review, and now I decided to come back and relive those fun times. But the game is so broken you can’t even start the first mission, none of the buttons work in the menu tutorial so you just get stuck. I’ve tried everything I can think of and can’t fix it, so yeah. It needs some big fixes. Good until my phone died. Worst use of $1.99! I WAS playing the game until my phone died in the middle of a story mode mission. I went on after my phone was charged and it showed the news feed like normal but once I got out of the news feed and my game showed the tabs on the bottom and the background but there was no way it would have let me do anything it was frozen! No matter how hard I try I can’t fix this! Ubisoft, please patch this! Is what this game is. Just downloaded it and can get past the profile screen. App Store says it works for X max. Doesn’t seem to. I really like the open world levels but please can you make an offline open world free play mode? I would really like that and I wouldn’t have to use cellular data all the time when I play the game. App isn't free and I can't even put my name in it. The game is stuck in user creation. Is anyone else having trouble with items and menus not scrolling? I have an iPad mini. Love the game. 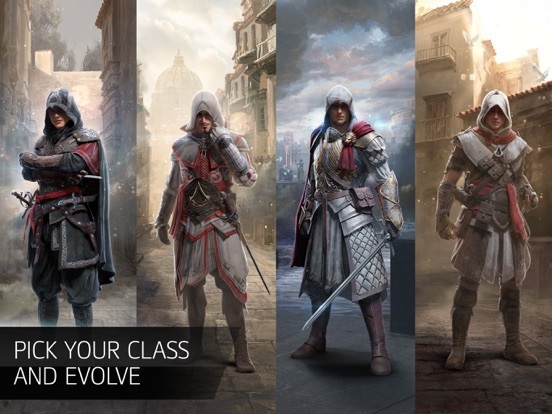 Very excellent AC experience for a phone or tablet! This game keeps freezing on my IPhone 8 Plus does work but doesn’t show the campaign and missions. *PLEASE UPDATE THIS GAME* It has a great potential. I deleted the game then reinstalled it but it cleared my data. I installed it again but restarted my phone before opening it and I got all my progress back!! Don’t get me wrong, this is an amazing game. They are some complaints I think you should know if you are thinking about getting this. First let’s start with the pros: The campaign mode was fun. It is also fun collecting all the info on the buildings and enemies. Also, collecting new items and powers (like sticky bombs) for my assassin is fun. 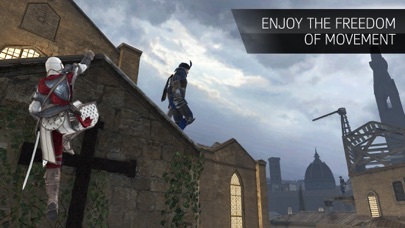 It is so fluid and feels natural climbing the rooftops and sneaking up on enemies. The cons: They devs need to fix the terrible forging system. I always get stuck with an item with a lower item level then the one I used to forge it and I never have enough credits to reforge the items. The game is 1.99 and has lots of in-app purchases. I understand that the developers need to make some money, but I don’t think they should sell levels. Also, the campaign mode is way too short. They need to add more levels instead of paying 2 dollars for a couple of extra levels. Please add more campaign (with no in app purchases). I think they can get money in other ways. Finally, I wish that the game would get updated graphics and maybe some transportation like horses. The game just doesn’t work anymore. It just freezes and shows the home menu with nothing even there except the music. No me abre el juego, ayuda! After maybe 30 minutes of gameplay I realized I had been doing the same things over and over again. Soon the game began repetitive and boring. Waste of money. Update for newer Phones needed. I just switched over from an iPhone 7 Plus to an iPhone XR and the app will not load past the connecting screen. I am connected to the internet because all other apps work perfectly. A friend of mine with the XS says he also has the same issue. Please fix! The missions and things are fun but I would like the opportunity to just roam around and do whatever I want. If there already is something like this then please direct me to it. Thank you! It feels old, which it is, but it is still a fun game to play. I love this game and bought it because I like AC Odyessy but I burned through it in an hour and a half. I guess that’s what I get when it only costs two bucks but still: more content please? It’s fun but I can’t see tips when using iPhone XR because the screen camera blocks most of the words. The only way to get around this is by flipping the screen which is very annoying. I love assassins Creed but I hate this game and if I am going to play it again it needs major updates. Please update this! Make new campaigns and maps nasau or Havana and Caribbean themed mission items to go with it. Claims the product works on IPhone X LIES! The Bluetooth controller on my iPad fifth gen tablet is not comparable. Can you fix this please. I love the game, it has beautiful graphics and amazing animations, however, I do miss the aspect of all-Time open world. I feel like this game could reach so much more potential if they unlocked that. For example, sort of just run around and kill your enemies, similar to PC and Console versions. I understand only so much can be done with mobile compatibility, but if this could be added, that would be very nice. Thanks! I played this game one day, then it stopped working. Please refund or fix the issue! Should not deal with this on a game I paid for. Game won’t play past building profile. Great job Ubisoft stealing people’s money. Would like to rate 5 negative stars! It’s a good game fun to play, but anytime you update the app it deletes everything or deletes a lot, and I’m tired of it. Can you please address the connection issues, and the continual in game error messages! I have played ONCE in many many attempts. I hope you enjoyed your weekend off while your customers steam! Great Game. Thanks for fixing it. Easily one of the better iOS games I’ve played. It’s nice not to deal with energy systems or loot boxes. Sure, there’s treasure chests you can get with coins but they’re not integral to the gameplay at all. What’s been the worst aspect has been the constant loading for me. Or should I say lack of loading. There’s been plenty of moments where the game would stop for minutes at a time, and I would have to close and reopen the game to continue. Perhaps the AC Identity Animus was fashioned out of a Commodore 64? When you guys updated the game, it stop working. The menu’s won’t work and can’t start any missions. Please fix or bring the game to the pc & consoles. Game does not work on iphone X. Gives error messages and gets stuck after first mission. I could play the game, albeit with frequent errors, until I finished the missions, at which time the menus froze. I reinstalled, and now can't get past the create profiles, and I can't play at all. Ubisoft hadn't addressed my week-old bug tickets. Expect that if you buy this game, you will not be able to play it. Ubisoft updated the game, but it's still broken! Who (didn't) test it? The leveling system is smooth and the combat is simple, some of the movement features could be improved. It seems to have a fairly developed text-based plot that follows what I believe is the narration of your assassin master? It seems vague at some points. Regardless of its flaws the game is certainly worth’s the price if you’re looking for an Assassin Adventure to take with you on the go. good game but new characters in console games not be here! better be here!!!! This game stopped working. I need a refund. This wasn’t that great I rather play Pirates so please put that back on the App Store. HOW MUSH APPS DO I HAVE TO DELETE INORDER TO PLAY??!????! I should have known better than to purchase a Ubisoft Game! Its one thing to charge money for in game currency for freemium games; but Ubisoft took it to a whole new level! Not only did they charge $4.99 for this game which would have been fine but then they expect you to pay for further campaigns! That is down right BS! Hey Ubisoft! I have purchased every Assassins Creed for console and I have never been charged more money to play yet another campaign!! Why would you start charging now and why would you think anyone with common sense would pay for it? If you were going to charge for campaign levels then you should of just made this a freemium game! Ubisoft is one of the largest game companies so would it have really hurt to give the campaign levels for free? Anyone reading this might be thinking well the starting campaign is worth the $4.99 right? WRONG! The original campaign is short and sweet. Basically the $4.99 your paying is for the Assassins Creed Name and Ubisoft Company! Other than that save your money and support a developer that cares about its customers and fan base! This game is a great game but there some small bugs that you need to fix. First of all when I’m behind the guards very close they notice me when they’re not looking directly at me. Also when I kill a guard they look like they are standing up and alive when it say they are dead. Another bug when I tried to do an action (like using my skill wheel or kill) I got stuck and can’t escape or exit the mission I have to exit and restart the app. The last bug I ran into is that when I finish a mission it show an error and didn’t give me the reward I have to restart the mission again to claim the reward. Also I want the game to have a free roaming mode so I can do stuff I want to do in the game. Thank you for reading this I hope you hear my advice. And I hope this is useful for the players that want this game. I love this game!! This my first AC game and I’ve enjoyed it I like the storyline as well as the codex entries you receive after each mission. It really enticed me to play the AC video games. Overall great games however my complaints are just that most of the uniforms are impossible to get without years of farming money. I do wish that there was a way to play to unlock the Forli’ campaign as I really wanted play to discover what the cube was that they discovered at the end. I see a lot of negative reviews about the price I fortunately got it 80% off!! Also one question and request to Ubisoft Question: are the friend message system moderated I haven’t accepted any friends for worry of online bullying Request: please make the uniforms cheaper or have more sales like the Heroic shop sale going on now. I really enjoy playing this game and have been since its’ release! But it is having some major issues that have gradually gotten worse and one star is all I can honestly give it at this time! The game play constantly lags, is jerky, freezes, and sometimes disconnects altogether. Also it has become very hard to control the direction of movement. There have always been occasional minor game play issues, but not like this and it’s getting to the point where it is just too difficult to get through the game! I only wish it ran as smoothly as the ads! No problems there! I was considering buying the Forli mission, but NOT when it is running like this! I use an Apple IPad Air which is running the most recent IOS update (11.2) I also have a strong WiFi connection/good internet speed. I do like this game very much but if the problem continues, well, it just really won’t be worth playing any longer! I've been playing this game since it was released and have loved it every day... until yesterday I tried to play it and all of my items, ranking, assassins, and even my abtergo account is gone! It updated two days ago, I can't think of anything I'd have done to get rid of all of my progress. Which I really upsetting because I had items from when the game first started that were awesome, like the Mirage Badge, the original Palisades outfit (I think is the name) and a few other really cool things. Now, they're all gone. I had four assassins, now gone. What happened to all my progress? I did not reset my account, so how would it have happened? The game is amazing without a doubt! The graphics are amazing and the stealth is pretty decent as well. However the controls are quite buggy and frustrating. For example, sometimes, the look controls on the right half of the screen sometimes change to movement controls and your character ends up moving instead of the camera moving, leading to getting detected and failing missions. Also, once you select an action, such as loot a chest, there is no way to cancel it. So if you suddenly want to turn around and run from the guards, you can’t! I wish there was a way to cancel such actions to avoid being detected. I really hope these controls are fixed and look forward to having more missions and regions added to this game. If Ubisoft makes a mobile game, don’t buy it! This only applies to mobile games. The only problem with this game is the lack of entertainment. The game is so inaccurate of the real Assassin’s Creed gameplay. The first reason is the lack of things you can do in the game. You can’t jump on walls. You can’t juke. You also can’t make elaborate attack patterns; the gameplay is simply spamming a button and hoping you don’t get unlucky. However, the game is fun in the first few minutes, but I don’t think 4.99 is worth it for a knock off Assassin’s Creed gameplay. Like seriously, they expect you to pay two more dollars on top of the five dollars you pay to even play the game? Like seriously Ubisoft, really? The only reason I haven’t deleted this is I spent too much money and I want to get the legendary sword of Altäïr. But, this isn’t worth devoting time or money into it. I used to play this game on my iPad mini with the Horipad Ultimate controller and it worked beautifully. I was able to get my AC fix without buying an Xbox, big plus. Then I had to get rid of my iPad mini and I got myself an awesome iPad Pro. Now, it’s been a while since I’ve played but I decided to pick it back up again and now it only senses when I use my analog stick and sometimes the menu(home) button. I’ve tried my controller on other games and it works just fine. This is a good game and I’ve enjoyed playing it so it gets 2 Stars, but I hate using the touch controls and not being able to use my controller has pretty much deemed the game unplayable to me. Once this odd issue is fixed though I’d be more than happy to bump this bad boy up to 5 stars! Ubisoft, the hardware that our phones have today that can run games are even better than the first series of PSP's BLOODLINE. No clear story, no plot, I'm not impressed. At least I only spent .99 for IDENTITY, after giving it about 20 minutes of gameplay, all I have seen are some decent animations of assassinations, and decent stealth mechanics(The only reason why this gets two stars). The climbing is about as expected. 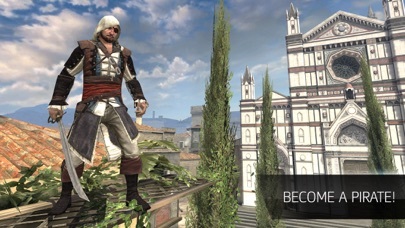 Yeah I have my own identity after making my own character, but if this is based on Ezio's time period, why not introduce him as an NPC that sends you on the quests that shape Ezio's legion of Assassin's. Abstergo is getting overrated, change it up and reintroduce some of our modern day Assassin's Creed crew. The game is fun for a mobile game however, the campaigns take you to level 15 maybe 16? And 2.2k ish power. Yet you want us to do the same contracts over and over and over for hardly ANY reward, I did a days worth of contracts and MAYBE got a level and a half and power boosted about 200. Which I believe is a “pay wall” to get people to pay to boost up to max lvl and power. But if you guys fix that and do hard mode and heroic modes for the campaigns so they can help you level up and get geared while making the missions harder, that’d be awesome. I’m almost at veteran and it’s extremely repetitive right now. 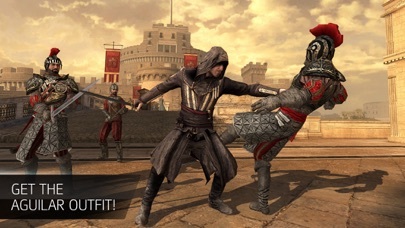 “Can you guys put floating animus bars on we’re the character is suppose to run to instead of having us look at the map and back I kinda find it frustrating especially for newcomers, just do it the same way AC2 and ACBrotherhood did it with Races.” Everything seems fine but I just wish this game was able to play offline and not be so laggy and please make the outfits buyable in game please, just my idea’s to improve the game. I personally love the game and would definitely invite my friends to play it. Though I have to say that despite how awesome the game it has it’s drawbacks. I mean the game keeps trying to “Synchronize” all the time. It wouldn’t matter really if it doesn’t take about 5-10mins to sync but sometimes it happens frequently that it just frustrates you and forces you to reload the game. Hoping that the syncing issue gets fixed soon cause the game is amazing but with the issue at hand it kind of makes you think that the game’s not worth playing at all. I started playing the game, and was immediately impressed. The graphics are incredible, and the gameplay mechanics are surprisingly well tailored, for what is usually a rather complicated game. However I encountered a problem shortly after I began playing the game. When I opened the application, it would not give me an option to click on anything other than the, inventory, skill set, and forge, buttons. So I can’t get into the main game, if anyone maybe the developers could help me with this that would be great, thank you! I’ve been playing this game for two days. Bought it for $1.99. Been having a lot of fun playing it. However, after the 8th mission or so, the game isn’t working anymore. I load it, it pops up with what should be the animus menu, but nothing’s there except the buttons. It won’t even allow me to click on the buttons anymore. When the game was working, it constantly required me to tap on the codex. And I would have issues with a lot of errors occurring. I would not recommend this game... Waste of time and money. See, I love the assassins creed games. I was so excited they released this game for mobile. Although, I have to admit, I’m a little disappointed they didn’t add a Freeroam mode. Like for instance, being able to just freely roam the town killing guards and stuff. 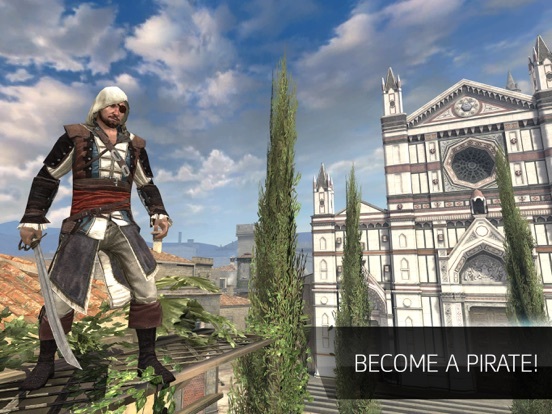 Like the assassins creed games where missions are an option and you can do whatever you want. Please take this suggestion. Especially for the people who bought the campaign expansion. It would be cool to roam on any map. This game is awesome! Definitely giving five stars for this game! Has key elements that get you in the feel of the main console game, but still quick enough to drop and pick it back up later at any point. I love the missions and the contracts. I would love to see more campaigns for it. 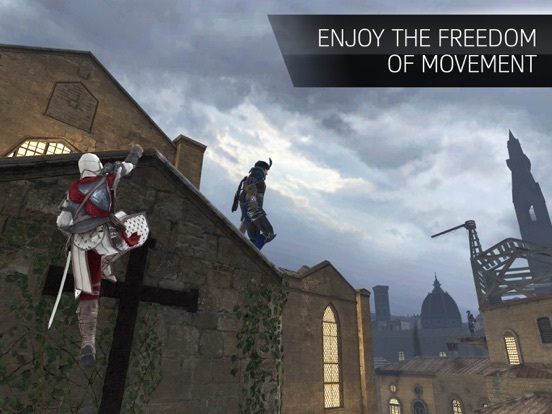 Otherwise it's a great game to play on the go when you really want to play Assassins creed. Make a free play mode please all you can do is play the same level over and over again which is boring please add a free play instead of the replay of levels but the game is really good just gets boring after beating the same level over and over again but I do recommend downloading this game if you want a good mobile assassin creeds game just add free play mode and I’ll give a 5 star rating. I like this game and I love the seasons creed series as a whole. But this game needs a lot of work. It feels as if this was just pushed out the door prematurely and sprinkled in some micro transactions. It does have some good elements like the parkour system and combat but I needs much more and the removal of the currency needed to upgrade a skill try making upgrade points kinda stupid. Overall it is a good game but it doesn’t feel finished what so ever. This Is the best game ever but can you make it offline with bots please because I need games on my device that are offline for my trips because I travel a lot so is there a way you can make this offline. Also can you make this game take up 60% of 2.4 gigabytes because if you made the price go down 60% than make the games storage 60% less space takes up. This game is GREAT. Super fun and has the same AC feel. I️ just wish the game campaign was a lot longer especially since it is a paid app. 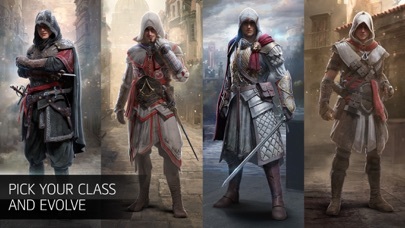 Also I️ wish there was more customization to the Assassin like individual parts not preset armor that comes as a package. Overall great game, smooth, captivating and if you are into AC or want to get into it it’s a must have game. Hope this was helpful. I’m stuck on create this assassin screen and the only thing I can interact with is the inventory and if I do I get stuck in the inventory. I have tried to delete and redownload game, I have reset my iPhone 8s and I have tried searching for answers online to no avail. Please can someone help me? 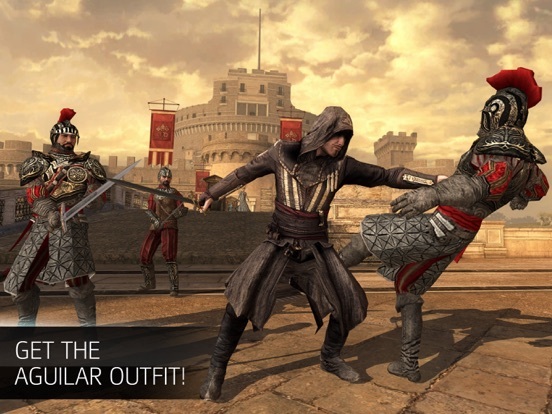 This is probably one of the best Assassin’s Creed game out for mobile thus far. Even when I am not playing on the console, I can play as I go right on my phone! The contract missions are endless & fun. I can play for hours and never get bored! Thank you Ubisoft for this game! I personally love Ubisoft games. Especially Assassin’s Creed. 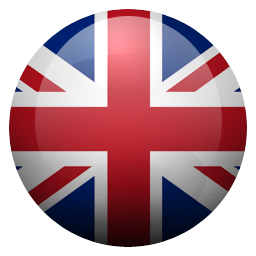 I play Freedom Cry, Unity, Syndicate, and the Chronicles trilogy. 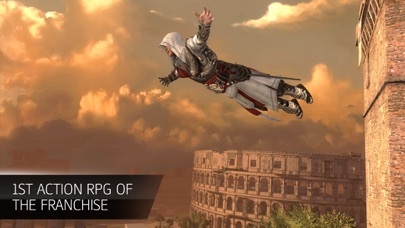 And I have to say that Assassin’s Creed Identity is the best Assassin’s Creed I’ve played. Though I think “A Crimson Sunset” should be free after paying for the game. 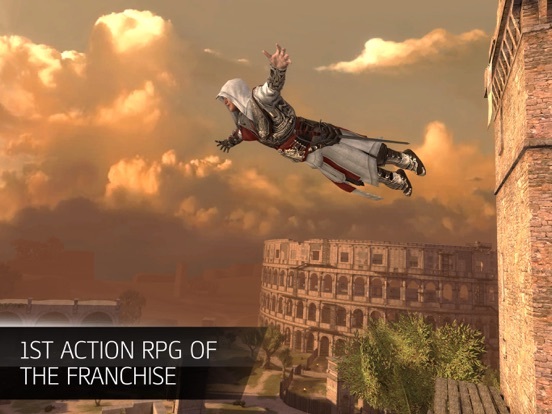 Anyways I do recommend making another Assassin’s Creed game on mobile phones. Love the assassin creed series. The game play is good but could be great! The art is top notch! Love the history, took from real events! Has a lot of buffering issues but that’s to be expected I guess. Wish Ubisoft would update the game but is just a wish. Over all great game! Awesome job Ubisoft! The game is fun even though I wish it was a little more responsive. It would be 4 stars but I literally paid for a game I CANT PLAY!! It goes to the main menu and freezes. I’ve uninstalled, re downloaded it, removed other apps, restarted the phone, etc. pisses me off I had to pay for it and this is the reason I NEVER BUY APPS. Maybe it’ll get fixed with an update but until then not happy.